Enjoy the wonder of this fairy tale goldilocks slot machine and tempt your tastebuds with 5 reels and 25 paylines of porridge filled fun. Spin through bonus reels matching Goldilocks and the rest of the 3 bears and this will trigger Scatter symbols and free spin bonuses that you will be sure not to miss. Match 3 Goldilocks symbols and this will triple any of your winnings on that particular spin. Quickspin create awesome video slot solutions, for gamers who love originality, quirk, and exciting new ways to win cash. As gamers themselves, they only release slots that they’d love to play, which means everything they deliver to market is ready to be enjoyed, and engaged with. With a culture built on diversity, passion, and friendship, every title they create carries this progressive way of creating entertainment. Get ready for some seriously playful fun from Quickspin; Goldilocks is a 5 reel, 25 payline online video slot loaded with cheeky characters and innovative wins. From the moment we find ourselves deep in the woods, where a family of three bears are about to receive an unusual visitor, we get the feeling we need to be mindful. The impish audio soundtrack is delicately whimsical, and is a welcoming introduction to this cheerful online slot. From a playful penny, to £250.00, we can try to get our hands on some serious cash, while Goldilocks treats herself to a nice sit down, a bowl of porridge, and a nice afternoon snooze while the Bears head off on their animalistic errands. However, they are never far away here; all 3 Bears appear on the reels, with Father Bear the most valuable of the Bear symbols. Mother Bear, Junior Bear, and Junior Bear’s stuffed Baby Bear all carry a slightly lesser value cash reward, with 10 through Ace card symbols all slightly lower again. There is also a Regular Wild, the Bear’s House, which will substitute all other symbols in the game except for the Multiplier Wild, a Bowl of Porridge. When any winning combination includes one or more of these symbols, a 2 to 4 times multiplier is added to the win. The Free Spins feature is activated by landing 3 or more Goldilocks symbols. 10 Free Spins are awarded, during which the Bears Turn Wild Feature can be activated. A Goldilocks Progress Scatter symbol will begin to land during the Free Spins, which turns the Bear symbols on the reels Wild for the remainder of the Free Spins session – while triggering additional Free Spins along the way. When the wins do start to pile up, we find that the playful nature of the game is suddenly very fast-paced and hectic. This nice contrast between the standard pace of the game and its bonus features make for some nice, variable spinning – and substantial wins. 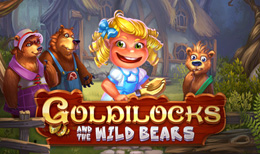 Quickspin have created a charming, fairy-tale themed slot with Goldilocks. Graphically, it is not fantastic, but it never has to be as all the illustrations are certainly straight from the pages of a children’s storybook – which fits the theme perfectly. The audio really makes the theme work fantastically well, and the Wild Bears feature is a great way to land some big wins – and remind us that this isn’t simply a children’s game! At Dream jackpot, we love it when a game developer perfectly encapsulates the theme of their game, and give Goldilocks a 9/10.